The innate immune system protects against infectious microbes by the recognition of pathogen- associated molecular patterns, which serve to detect pathogens on the host cell surface or in endosomes by pattern recognition receptors such as Toll-like receptors, nucleotide-binding oligomerization domain-containing protein-1-like receptors, mannose-receptor, or retinoic acid-inducible gene-1- like receptors that initiate proper host defense mechanisms. 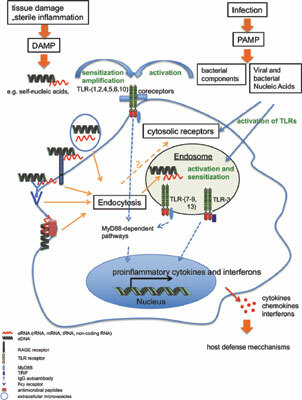 In addition to pathogen-associated molecular patterns, a series of endogenous danger-associated molecular patterns, such as nucleic acids, are recognized by pattern recognition receptors, which serve as body´s own alarm signals under sterile conditions, such as ischemic injuries, trauma, tumors, tissue transplants, or autoimmune diseases. Thus, exogenous as well as endogenous nucleic acids can function as “alarmins” to alert the body about danger or disease by triggering inflammation, dendritic cell maturation, and stimulate the immune response resulting in the release of cytokines, which in turn can augment the local inflammatory environment. Moreover, danger-associated molecular patterns such as nucleic acids can act as cofactor in the activation of pattern recognition receptors in situations of cellular stress or upon infection leading to a massive amplification of the inflammatory response. As a consequence, acute and also chronic inflammatory diseases such as rheumatoid arthritis, cancer, or atherosclerosis may depend on such perpetuated proinflammatory responses involving activities of nucleic acids. As antagonists, RNase1 or DNase administration or nucleic acid complexing agents may result in a significant blockade of the outcome of particular pathological situations and in considerable tissue protection. Pattern recognition receptors, extracellular nucleic acids, innate immunity, toll-like receptor, systemic lupus erythematosus, DAMPs.